This is a General Admission - Standing Room Only Event. This show is for All Ages All support acts are subject to change without notice. Doors for this event open at 7:00 PM. Show starts at 8:00 PM. Coming to you all the way live from Bogotá, Colombia, Bomba Estéreo’s psychedelic cumbia mix creates a space where transcendent vibes and grooves meet up in one place. According to the band’s founder Simón Mejía, that was the artistic thrust behind "Amanecer," the band’s GRAMMY-nominated album which has received rave reviews from NPR to Rolling Stone and Pitchfork to Billboard. 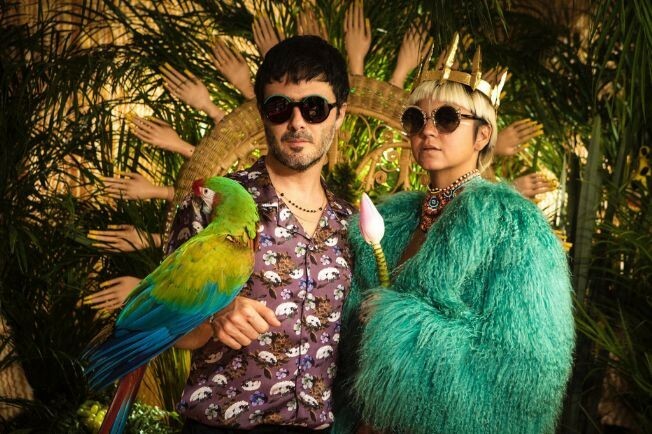 Bomba Estéreo is an international touring machine with recent dates on the world’s biggest stages. The group have toured across 40 countries,four continents and played major festivals like Glastonbury, Coachella, Austin City Limits, Lollapalooza, Outside Lands, Sonar, Roskilde, Vive Latino, among many others. In a sense Amanecer is a logical progression from Bomba’s already established track record in fusing the electro-boogie/hiphop soundtrack of their millennial youth with the tropical folkloric legacy of their homeland’s elders. From their early success with their first hit single “Fuego”—a cumbia/house/hiphop/reggae jam--to the lush dance/pop grooves of 2013’s Elegancia Tropical, the band has been on an ever-evolving mission of hemispheric musical convergence. in the Caribbean port city of Barranquilla, a Mardi Gras party second only to Rio’s in intensity. Marching band drums n’ bass meet Li’s distorted vocals in a hallucinogenic dance of demonic disguises and party all night imperatives. But Amanecer is no one-night stand. It’s an album that represents the culmination of so many years of experimentation and wild groove-swapping that has come to blossom in a strong, authentic international pop sound. It shows that no matter how much some people are obsessed with borders, these artificial divisions are unraveling as we speak, and as we listen and dance to the global-identity sound of Bomba Estereo.